Much like baby mammals nursing at the teats of their mothers, researchers have recorded the tiny insects gathering to feed on super-nutritious milk produced in an opening from which the eggs are released. Until now lactation has been considered a purely mammalian trait. Although some non-mammals such as pigeons, flamingos, emperor penguins and cockroaches produce a similar nutritious fluid it is considered fundamentally different to milk both in production and use. But researchers at the Chinese Academy of Sciences in Beijing said the fluid secreted by the spiders was four times as nutritious as cow's milk, and could be considered as true milk. They found that feeding continues long after the little arachnids can forage on their own and probably evolved during a period when food was scarce. Writing in the journal 'Science', Dr Rui-Chang Quan said: "Extended parental care could have evolved in invertebrates as a response to complex and harsh living environments that require offspring skills to be fully developed before complete independence. "The mother's physiology, behavior, and cognition might have changed to adapt to providing milk and prolonged maternal care as in mammals. "We anticipate that the discoveries presented in this study will encourage a re-evaluation of the evolution of lactation and its occurrence across the animal kingdom." 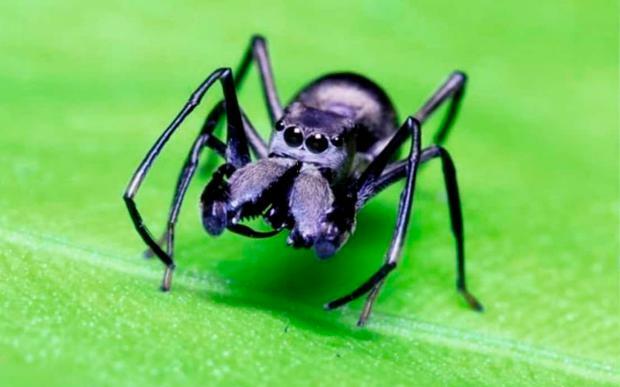 Scientists studied the ant-mimicking jumping spider (toxeus magnus) because of its strange communal living arrangements in which adult females were often seen cohabiting with juveniles when most other spider young had left the nest. The researchers speculated the teenagers hung around because they were still receiving food from their mother. After following the spiderlings from hatching, the scientists noticed that for at least 20 days neither mother nor babies left the nest, yet the offspring trebled in size in the period after suckling from the mother.